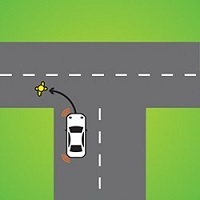 Is it true that you must give way to the right in all situations? That's not always the rule. At an unsigned crossroad, you must give way to all vehicles approaching from your right. But if you want to turn right, you must give way to all oncoming vehicles too. If you're driving on a road that ends in a T-intersection, you must give way to all vehicles on the continuing road. And naturally, if you come to a stop sign or a give way sign, you must give way to all other vehicles as well. 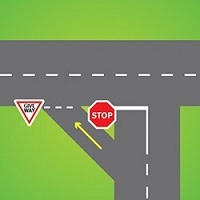 So what happens at an intersection with both a stop and a give way sign? 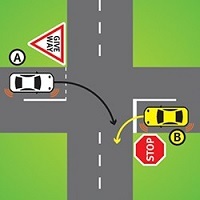 Contrary to popular belief, a stop sign is not more powerful than a give way sign. The signs effectively cancel each other out and normal give way rules still apply. 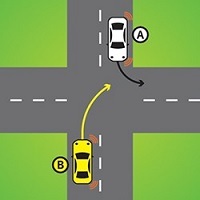 Both must give way to all vehicles, then because car A is turning right, it must give way to car B. Finally, if you're planning to do a U-turn, you must give way to all other vehicles before turning. 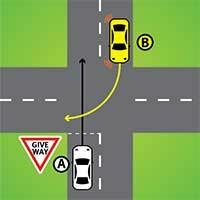 Knowing the give way rules helps you drive safely and avoid crashes. 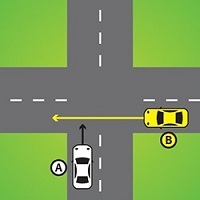 In this example, 2 vehicles are opposite each other at an intersection. 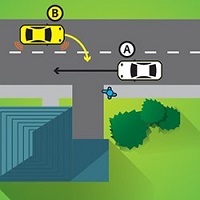 Vehicle B (in yellow) is turning right across the path of vehicle A (in white) who has a give way sign. 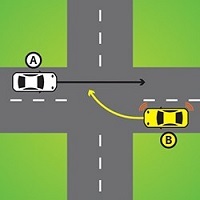 Vehicle A (white) must give way to vehicle B (yellow) because vehicle A has a give way sign. You must give way to vehicles on your right at an uncontrolled crossroad—this is a crossroad without any traffic lights, lines or signs. turning left at the intersection. 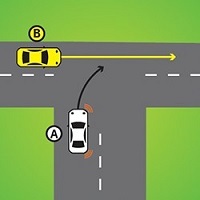 In both examples, Vehicle B (yellow) must give way to Vehicle A (white). 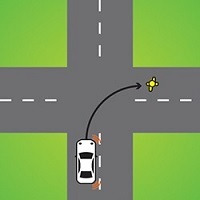 A slip lane is an area of road for vehicles turning left that is separated from other parts of the road by a painted island or traffic island. If you're using a slip lane, you must give way to all traffic already on the road you're entering (except vehicles doing a U-turn). A bus is a vehicle that can carry 13 or more people (including the driver). the shoulder of the road, or the left side of the road. Remember to take special care around school buses, especially when their yellow lights are flashing. Watch out for children who may run across the road from in front or behind the bus. Buses, like all other vehicles, are required to indicate for 5 seconds before moving off from a parked position, which includes a bus stop. You must give way to all other vehicles and signal for at least 5 seconds when you drive on to the road from a parked position on the side of the road or in a median strip. When you are entering or leaving a road from private property or a driveway, you must give way to pedestrians or bicycle riders on the footpath or road. You must also give way to any vehicles on the road you are entering. These rules apply whether you are driving forward or in reverse. 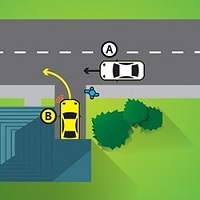 In both examples, Vehicle B (yellow) must give way to Vehicle A (white) and the pedestrian about to cross the driveway. You must give way to pedestrians on or entering a road you're turning into or entering. 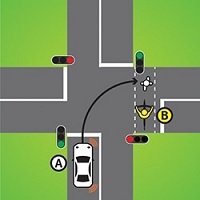 This includes pedestrians or bicycle riders that are crossing on the green 'walk' signal at an intersection controlled with traffic lights, and you are turning into the road they are crossing. In both examples, the white vehicle must give way to the yellow pedestrian crossing the road. In this example, Vehicle A (white) must give way to bicycle rider B (yellow) and the pedestrian crossing the road. There are many road signs around to let you know what you should do and if there are rules you must follow.